Making off with some country house treasure is the goal in Wild Heist at Peacock Manor, a Victorian era crime-themed video slot from Thunderkick. Boasting the developer’s usual superb design, it’s not short on features either including plenty of wild extras and a free spins round with multipliers, symbol upgrades and even more wilds. Join the grand heist on your desktop, tablet or mobile device from between 10p and £100 per spin. Thunderkick don’t make ugly games and Wild Heist is as easy on the eye as you’d hope. The reels include lower value playing cards plus a quartet of higher value Victorian era characters. The best of the symbols is the golden peacock. This spins in a stacked formation and offers awards of up to 20 times your total bet per payline. The wild too offers similar rewards. Wild Reels feature – up to 3 reels can turn totally wild this becomes active. Random Wilds feature – up to 7 extra wilds will appear at random and a new payout consideration is made. Walking Wilds feature – a series of respins aware awarded here with the wilds moving 1 reel to the left with each respin. The round continues until they’ve all dropped off the edge of reel 1. Wild Heist also comes with a Bonus Game feature, complete with plenty of extra goodies. To trigger the feature, you’ll need to land 3 key scatters on the same spin – you’re rewarded with 7 initial free spins. Before the free spins start, you’ll be offered a selection of playing cards. Choose 5 of them. These will add extra free spins to your total, multipliers, turn a medium value symbol into a wild or trigger 1 of the random wild extras. Hope to see 2 or more scatters hit during the free spins as you’ll be awarded a repick. As its name suggests, you’ll choose another card and bring another modifier extra into play. Thunderkick has become one of our favourite developers thanks to their combination of quality design and innovative extras. Wild Heist at Peacock Manor ticks all the boxes on both scores. The sound and visuals are excellent and there’s plenty of variety on offer from the extras. The game manages to pack in plenty of volatility too making it a good choice if you enjoy high variance play. 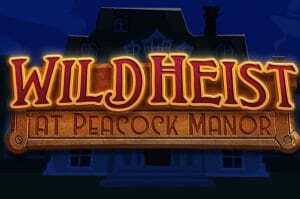 If you fancy playing a slot that is easy on the senses, brimming with extras and offers a real payout punch then we’d recommend Wild Heist at Peacock Manor. They also have plenty of other excellent titles with Flame Busters and Luchadora 2 of their better ones.